The US dollar retraced some of the previous gains but managed to retrace the retracement as well. Japan’s Lower House Elections, UK inflation and employment data and the most important event: the last Fed decision for the year are the main highlights for this week. Follow along as we explore the Forex market movers. Japan Lower House Elections: Sunday. Japanese Prime Minister Shinzo Abe’s ruling party is expected to win sweeping victory according to media projection. Abe’s Liberal Democratic Party (LDP) is expected to take 303-320 seats of the powerful chamber’s 475 seats, reaching “super majority” needed to override votes in the upper house. The elections were called after Abe decided to push back the next sales tax hike as the previous one threw the country into recession. With high expectations, a failure to win a convincing majority could send the yen soaring and USD/JPY plunging down. UK inflation data: Tuesday, 9:30. UK inflation edged up to an annual rate of 1.3% in October, following 1.2% in the previous month. Analysts expected CPI to remain at 1.2%. Prices in the recreation and culture sectors increased while transport costs, as well as food and non-alcoholic beverages, fell. Despite this rise, the Bank of England warned the inflation rate could dip to as low as 1% in the coming months. However, the small rise in the rate of inflation is unlikely to alter the central bank’s decision to keep its key interest rate at 0.5% for the time being. Inflation is expected to reach 1.2% in November. German ZEW Economic Sentiment: Tuesday, 10:00. German economic sentiment rebounded in November, rising 15.1 points from October to 11.5. Analysts expected a modest improvement of 4.5 points towards 0.9 points. The recent encouraging signs of growth in the Eurozone suggesting the economy is stabilizing, contributed to the rise in sentiment. Economic sentiment is expected to edged up to 19.8 in December. UK Governor Mark Carney speaks: Tuesday, 10:30. Mark Carney, head of the Bank of England is scheduled to hold a press conference and talk about the Financial Stability Report in London. Despite elevated household confidence, as well as other economic indicators, including a recent positive trend in wage growth, the Eurozone struggling economy poses the major threat to the UK’s recovery. US Building Permits: Tuesday, 10:30. The number of permits for single- and multi-family housing edged up 4.8% in October, reaching a 1.08 million-unit pace, the highest since June 2008. The sharp rise in October was preceded by another increase in the prior month indicate a recovery trend in the housing market. However, the recent acceleration in demand is expected to boost wages and contribute to economic growth. The number of permits for single- and multi-family housing is forecasted t reach 1.06 million. UK employment data: Wednesday, 9:30. The number of unemployed in the UK fell by 20,400 in October, reaching 931,700, the lowest level since August 2008. The sharp drop continued a positive trend in the UK labor market with an 18,400 fall in September and a 33,400 decline in August. The ongoing improvement in the job market is an encouraging sign that wages will eventually pick-up and boost UK’s domestic economy. Claimant Count Change is expected to drop by 19,800 this time. It is also important to note wages: a rise of 1.3% is expected in average hourly earnings. The unemployment rate is predicted to tick down to 6% from 5.9% last time. US inflation data: Wednesday, 13:30. U.S. consumer prices remained unchanged in October, following September’s rise of 0.1%. Analysts expected a 0.1% decline in October. On a yearly base, consumer price index also remained unchanged from September’s increase of 1.7%. Excluding food and energy costs core consumer prices gained 0.2% in line with market forecast. On an annual basis, core CPI rose 1.8%, and remains below the Federal Reserve’s target of 2.0%. CPI is expected to decline 0.1%, while core CPI is predicted to gain 0.1%. Fed decision: Wednesday, 19:00, press conference at 19:30. In the last FOMC gathering in October, the Fed ended QE3 as expected, ending all doubts. 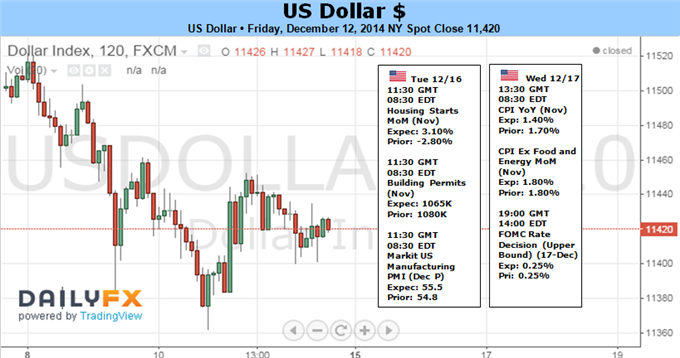 Their bullish view of the labor market gave a boost to the dollar. The main focus of this meeting is the “considerable time” phrase related to the timing of the first rate hike. There is speculation that the Fed will alter the phrasing and call for patience on the rate hikes. Given the recent jobs report, which finally included a rise in wages, there is also a chance that the Fed totally removes this wording thus hinting of an earlier rate hike, perhaps even in March. In addition to the statement, the Fed releases its forecasts, including the famous “dot chart”. The last release showed rates rising to 1.375 on average by the end of 2015. Will this average be pushed back with lower inflation expectations? And last but not least, Fed Chair Janet Yellen meets the press and reporters will likely try to extract some more specific wording about the timing of rate hikes. There are quite a few wild cards here and volatility is certainly expected to be wild. All in all, an upbeat view on the US economy should keep the dollar bid, while dovish caution, something that the Fed does very often, would weigh on the greenback. NZ GDP: Wednesday, 21:45. New Zealand’s economy expanded at the fastest pace in 10 years in the second quarter, as Gross domestic product edged up 3.9% on a yearly base and 0.7% from the first quarter. Both readings exceeded market forecast. Strong domestic demand is the major growth force in New Zealand’s economy, but surging exports to China have also contributed to this expansion. Gross Domestic Product is expected to gain 0.7% in the third quarter. German Ifo Business Climate: Thursday, 9:00. German business sentiment rebounded in November, reaching 104.7 from 103.2 posted in the prior month. The reading was better than the 103 points forecasted by analysts, signaling the downturn trend in German economy has halted. The slowdown in economic activity was led by the euro-area partners’ sluggish demand and a sharp drop in exports to Russia. The third quarter growth rate reached just 0.1% after a 0.1% contraction in the first quarter. However recent economic data suggest an ongoing improvement in the German economy. German business sentiment is expected to improve further to 105.6. US Unemployment Claims: Thursday, 13:30. The number of Americans filing initial claims for unemployment benefits dropped 3,000 last week, reaching 294,000, staying below the 300,000 level. Analysts expected claims to reach 299,000. However, despite the fall in weekly claims, the number of continuing claims increased from 2.372 million to 2.514 million. The 4-week moving average increased to 299,250, from 299,000 posted last week. The number of initial claims for unemployment benefits is expected to reach 297,000 this week. US Philly Fed Manufacturing Index: Thursday, 15:00. The Philly Fed manufacturing survey jumped from 20.7 in October to 40.8 in November posting the highest reading since December 1993. The big rise suggests increased growth in manufacturing activity. New orders and shipments showed similar improvement this month. Employment was higher and the outlook indicator showed expected growth will continue over the next six months. Manufacturing activity in the Philadelphia area is predicted to rise to 26.3 this time. Japan rate decision: Friday. The Bank of Japan’s November Statement revealed the bank is willing to step up its operations of quantitative and qualitative monetary easing and presented its assessment of the outlook of the Japanese economy. The Policy Board members stated the weaknesses in demand after the consumption tax hike implementation. Prime Minister Shinzo Abe announced he would postpone the 2 percentage point tax hike scheduled for next October and also called for a general election. Last edited by 1Finance; 12-12-2014 at 03:47 PM. The Dow Jones Dollar Index dropped this past week for the first time since the mid-October, market-wide slump. At the same time, the S&P 500 suffered its worst tumble since mid-2012. This hefty decline in capital markets and subsequent swell in volatility measures has the look-and-feel of a broad risk aversion move. This correlation between what is traditionally considered a safe haven currency and the financial system’s most stubborn speculative beacon (US equities) has many calling the Greenback a ‘risk’ currency at the same time anxiety over systemic risk aversion sets in. With a vested interest in risk trends and a high-profile FOMC rate decision ahead, plan for a potentially volatile week for the Dollar. While the Fed meeting will be top event risk for both the US currency and broader markets, it will be important to get the lay of the land heading into the release. In particular, the steady rise in implied volatility (expected price swings) alongside the uniform retreat in growth and yield-dependent assets has many market participants unnverved. Historically, there is a seasonal effect that sees the S&P 500 climb (averaging 1.9 percent) and volume drain to its lowest level of any month according to data going back to 1990. While it may not be difficult to deviate from the so-called ‘Santa Claus’ rally, it is difficult to overcome the liquidity exit. It would take heavy fundamental and price-based change to motivate traders to remain active. If we fall short of the full-scale risk aversion pace, a correction from the Dollar and US equities would reflect a natural moderation of one-sided markets – not particularly surprising given the former’s five-month rally to multi-year highs and the latter’s incredible six-week surge (a record breaking 29 days above the 5-day moving average) to record highs. Left undisturbed, a further retreat for both would be highly likely. Yet, given the items on the docket ahead, it is unlikely to be a quiet moderation. In terms of volume, there are plenty of speculative-worthy updates ahead. The focus, however, will be set on a single event: the FOMC rate decision. This is one of the ‘quarterly’ meetings where the regular decision on rates and unorthodox policies as well as the monetary policy statement will be accompanied by updated forecasts (growth, inflation, employment and – most important of all – intrest rates) and Fed Chairwoman Janet Yellen’s press conference. There will be two particular elements to this event which traders will be watching: a change to the interest rate consensus and what will be done with the ‘considerable time’ language. The infamous ‘dot plot’ has fueled plenty of hawkish speculation – particularly with the last update in September. The consensus forecast for the benchmark lending rate was 1.38 percent through the end of 2015. To reach that level and still conform to the expected ‘mid-2015’ first hike, the Fed would have to practically raise rates through each of the policy meetings in the second half of the year. That seems aggressive given current inflation forecasts and the specter of cooler global growth trends seeping into the US. As such, a moderation of this aggressive clip is likely. But, how market-moving would it be? Fed Funds and Eurodollar futures are already significantly discounting the rate move (pricing in approximately 50 bps worth of hikes through year’s end). The other key aspect of the meeting will be the ‘considerable time’ language that has been repeated in the accompanying statement for over two years. This phrase is considered a buffer zone whereby each time it is revisited, the market expects at least another six months without a hike. A few Fed officials – including Yellen – reinforced that particular time frame this past year. In the past few months, officials have weighed in on dropping it from the text. If we don’t see it, the market will set its countdown for six-months (June 18 meeting). Yet, here too, a ‘mid-2015’ hike has been a well-priced mantra. What matters more: the first move or the pace? 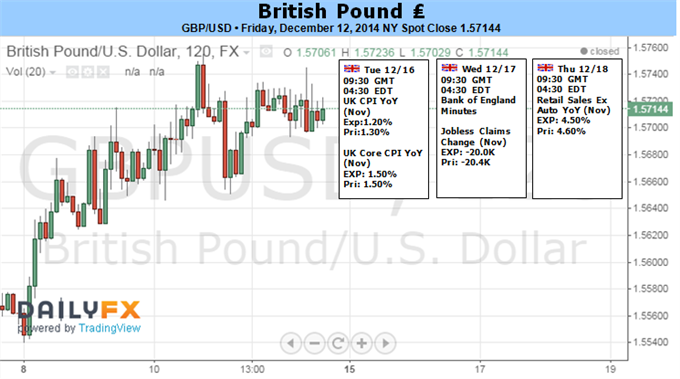 The British Pound finished the week modestly higher but continued to trade in a tight range versus the US Dollar. A busy week ahead threatens to force a decisive break in the GBPUSD and other pairs. The simultaneous release of UK Jobless Claims and Earnings data with Bank of England Minutes will likely prove the highlight in the days ahead, and GBPUSD traders should likewise keep a close eye on a highly-anticipated US Federal Reserve interest rate decision that same day. Earlier-week UK Consumer Price Index inflation figures as well as late-week UK Retail Sales results could also elicit reactions from GBP pairs. Whether or not the Sterling mounts a sustained recovery versus the US Dollar will likely depend on the direction of interest rate expectations for both the Bank of England and the US Federal Reserve. A sharp compression in the spread between UK and US government bond yields helps explain why the British Pound fell to fresh 14-month lows versus the Greenback through November. Yet a great deal of uncertainty surrounds both the Fed and BoE; any surprises out of the coming week’s economic data and central bank rhetoric could easily force a repricing of yields and the GBPUSD exchange rate. The US Dollar in particular looks vulnerable on any disappointments from the Federal Reserve, and indeed the previously-unstoppable USD finally showed concrete signs of slowing through the past week of trade. And though the Sterling could itself see fairly significant volatility on UK event risk, we expect that the overall US Dollar trend will ultimately dictate whether the GBPUSD makes a sustained recovery. Price & Time: USD/JPY - What Next? The near-term outlook for USD/JPY remains mired by Japan’s December 14 snap election, but the ongoing deviation in the policy outlook should continue to produce a further advance in the exchange rate as a growing number of Fed officials show a greater willingness to normalize monetary policy in 2015. Despite the risk for a material shift in fiscal policy, recent headlines suggests ‘Abenomics’ will continue to influence the Japanese Yen in the year ahead as the Liberal Democratic Party (LDP) is widely expected to retain majority in the lower-house of the National Diet. As a result, the Bank of Japan (BoJ) may continue to highlight a dovish outlook for monetary policy at the December 19 meeting, and Governor Haruhiko Kuroda may keep the door open to further expand the asset-purchase program as the technical recession undermines the central bank’s scope to achieve the 2% target for inflation. In contrast, there’s growing speculation the Federal Open Market Committee (FOMC) will remove the ‘considerable time’ phrase and implement a more hawkish twist to the forward-guidance as lower energy costs boost disposable incomes for U.S. households. The improved outlook for personal consumption – one of the leading drivers of growth – may encourage the Fed to boost its economic and interest rate projections as the central bank anticipates a stronger recovery in 2015. With that said, the bullish sentiment surrounding the greenback may gather pace over the remainder of the year should the fresh developments coming out of the FOMC heighten interest rate expectations. In turn, the fundamental outlook continues to cast a long-term bullish outlook for USD/JPY, and we will retain the approach to buy-dips in the exchange rate unless there’s a meaningful change in fiscal/monetary policy. Dollar-yen appears to be coiling for a move higher as it holds above the 117.00 handle, with the next key topside objective for USD/JPY comes in around 122.30-40, the 78.6% Fibonacci retracement from the 2002 decline. 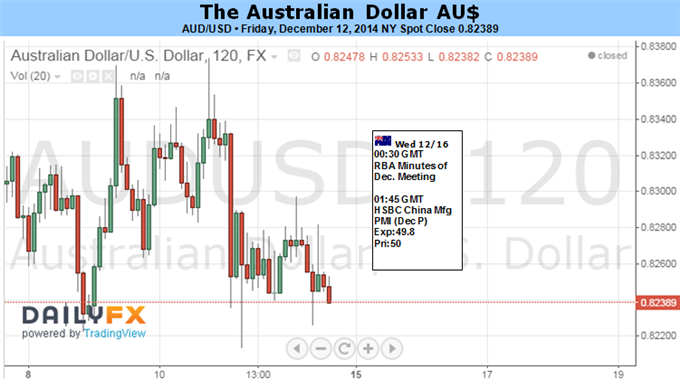 The Australian Dollar finds itself torn between conflicting forces as year-end liquidation on trends dominating markets in 2014 gathers momentum. Swelling risk appetite – embodied by a relentless push upward by the S&P 500 – and a firming US Dollar have been defining themes in the past year. Profit-taking on these trades ahead of the transition to 2015 has produced a parallel downturn in the greenback and the benchmark stock index. This dynamic carries conflicting implications for AUDUSD. On one hand, the prices are being offered support by a market-wide unwinding of long-USD exposure. On the other, the shedding of risk-on exposure is putting downward pressure on the sentiment-geared Aussie Dollar. Not surprisingly, this produced relative standstill, with prices locked in a narrow range and waiting for guidance even as notable reversals are recorded elsewhere in the anti-USD space. A shift in the relative monetary policy outlook may break the deadlock in the week ahead. Shifting expectations over recent weeks have delivered a priced-in G10 forecast that sees the RBA as one of the most dovish central banks in 2015. Indeed, with OIS rates implying at least one interest rate cut in the coming 12 months, the Australian monetary authority leads on the conventional policy easing front. Only the BOJ and the ECB may edge out Glenn Stevens and company for the most-dovish crown, and then only via expansions of non-standard measures. This stands in stark contrast with the policy trajectory at the Federal Reserve. Markets are betting on at least one rate hike in 2015 and have been flirting with the possibility that US officials will be able to squeeze in two of them before year-end. US economic news-flow appears to be gathering steam relative to consensus forecasts once again. Data from Citigroup suggests that, on the whole, realized outcomes are now outstripping expected ones by the widest margin since mid-September. This has already encouraged markets to bet on the sooner arrival of the first post-QE rate hike. Next week’s FOMC policy announcement – this time complete with an updated set of economic projections and press conference from Chair Janet Yellen – may see the timeline shorten further. On the domestic front, minutes from December’s RBA meeting will be in the spotlight. The markets were not meaningfully swayed against betting on a 2015 rate cut by the neutral statement that emerged out of that sit-down. This suggests that anything but a convincing hawkish rhetorical shift – an outcome that seems overwhelmingly unlikely even on a relative basis – will keep bets on a 25-75 basis point pro-USD move in the policy spread comfortably in place. Taken together with guidance from the Fed, that may tip the scales to produce a bearish break out of consolidation for the Aussie. Gold prices are markedly higher this week with the precious metal rallying 2.5% to trade at $1222 ahead of the New York close on Friday. The advance comes amid a turbulent week for broader risk assets with global equity markets selling off sharply on global growth concerns. Weakness in the US Dollar and falling crude prices have further impacted risk appetite with gold well supported as investors sought alternative stores of wealth. Despite the gains however, prices continue to hold below a key resistance threshold with the near-term risk weighted to the downside heading into next week. It was a rough week for equities with the SPX off more than 2.70% on the week as growing political uncertainty in Greece and concerns over the weakening outlook for global growth sparked a wave of profit taking. The accompanied sell off in crude prices, which hit lows not seen since 2009 on Friday, have continued to weigh on broader market sentiment, with gold catching a bid early in the week. Looking ahead to next week, US economic data comes back into focus with the November Consumer Price Index and the highly anticipated FOMC policy decision on Wednesday. As officials anticipate weaker energy prices to boost disposable incomes for U.S. households, the recent pickup in job/wage growth may embolden the committee to take a more hawkish stance on monetary policy with speculation circulating that the central bank may look to remove the “considerable time period” language as it pertains to interest rates. Should the subsequent presser and updated growth projection show a more upbeat assessment, gold could come under pressure as investors begin to bring forward interest rate expectations. That said, the trade remains vulnerable near-term just below key resistance. From a technical standpoint, gold has now pared 50% of the decline off the July high with the move into the $1237 target we noted last week . This level converges with a median line dating back to August 2013 and near-term the risk remains weighted to the downside while below this threshold. A breach above targets subsequent targets at $1248 and a key resistance range at $1262/68. Interim support rests at $1206 and $1196 with only a move sub-$1179/80 shifting the broader focus back to the short-side. Bottom line: longs at risk near-term sub $1237 with a pullback likely to offer more favorable long-entries lower down. A breach of the highs keeps the topside bias in play with such a scenario eyeing targets into the 200-day moving average. Last edited by 1Finance; 12-13-2014 at 09:32 AM. 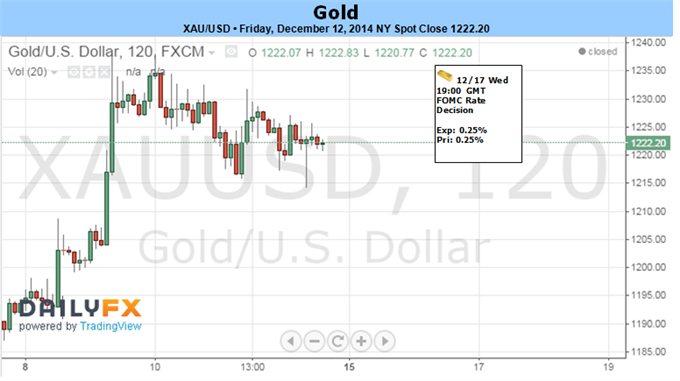 The gold markets rose during the course of the week as you can see, testing the $1250 level. That being the case, we think that the market could run into a significant amount resistance here, but we do not have the right setup to start selling yet. Ultimately, we think that this market will test the $1150 level given enough time, so at this point time we are not necessarily excited about buying gold. However, we recognize that if we get at least a daily close above the $1250 level we could start buying. Last edited by 1Finance; 12-13-2014 at 09:49 AM. 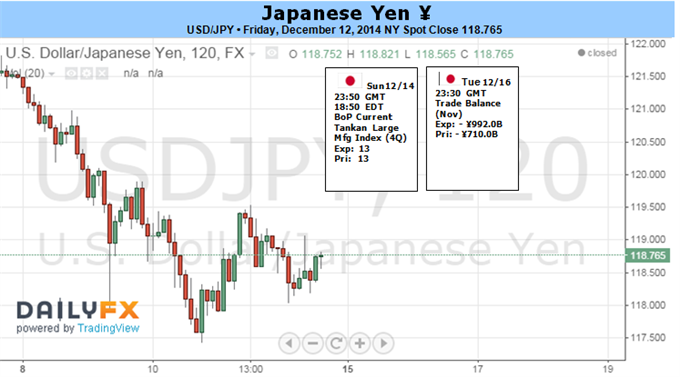 The USD/JPY pair fell during most of the week, slicing down to the 118 level. With that being the case, we ended up finding support in that general vicinity, and we believe that the markets will continue to find buyers at lower levels. We think that the 115 level is the “floor” at the moment, and we are looking for supportive candles in order to start buying again. We have absolutely no interest in selling this pair, and believe that just simply being patient is the way to find buying opportunities again and again. The USD/CAD pair initially fell during the course of the week, but then shot through the resistance at the 1.15 level in order to continue to show serious strength. With that, the market looks as if it’s ready to continue going on its next leg up, and that pullbacks should offer value in the US dollar. The 1.13 level should be massively supportive, so we do not believe that the market will fall below there. Ultimately, we believe that this market will then head to the 1.20 level given enough time. The NZD/USD pair broke higher during the course of the week, as we found a bit of support below. However, there is still a significant amount of resistance above, at the 0.80 handle, and with that we feel that the sellers will step in sooner or later. We have no interest in buying this pair, as the Royal Bank of New Zealand continues to work against the value the Kiwi dollar going forward, and as a result we feel the market will ultimately go to the 0.75 handle.